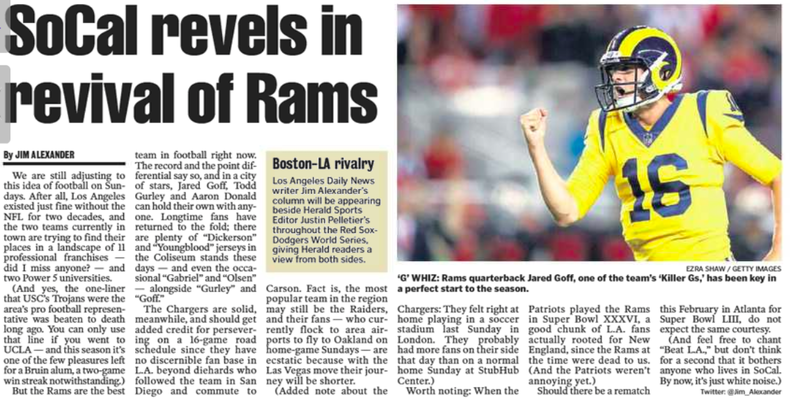 Taking a cue from the Boston Globe’s Home/Away feature that matches up Globe columnist Christopher Gasper with a columnist from the hometown paper of that week’s Patriots opponent, the Boston Herald ran this on page 2 of Tuesday’s edition. Good idea, if derivative. 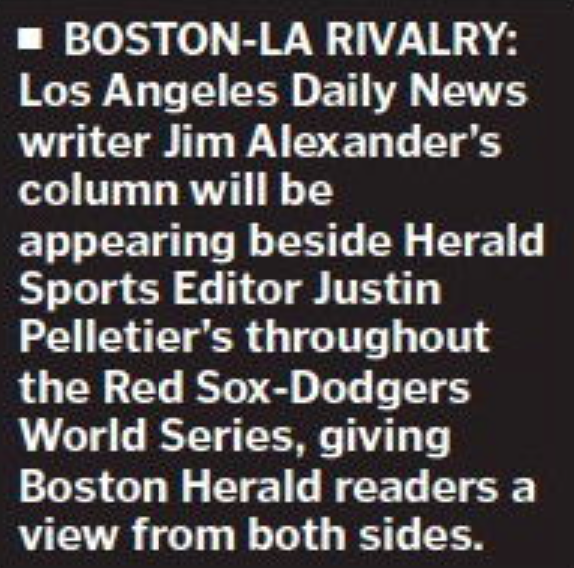 Tuesday’s columns were a compare ‘n’ contrast of the respective ballyards of the World’s Serious rivals, with Fenway holding the obvious edge. But then yesterday Alexander wrote about the Bruins-Kings NHL rivalry, and Pelletier nattered on about Bobby Orr vs. Wayne Gretzky, which seemed more than odd to the headscratching staff. Of course, the columnists can’t write about what they should be – namely, last night’s baseball game – because the flimsy local tabloid is printed in East Jesus, Rhode Island around dinnertime the night before. Boston Herald Subscription: Biggest. Waste.Ever. Stop the Presses! Boston Herald Beefs Up Newsroom! Much to the delight of our kissin’ cousins at One-Daily Town, the Boston Herald has – at least temporarily – stanched its newsroom bleeding (see One-Daily’s Hexit Watch™) and actually added personnel. Witness this Herald Staff piece in today’s edition of the waxy local tabloid. 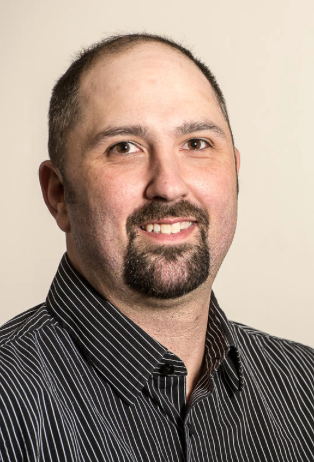 Award-winning journalist Justin Pelletier, who has built a career leading coverage of local and professional athletics across print and digital platforms, has been named as the Boston Herald’s sports editor. A graduate of Boston University, Pelletier has served as managing editor and sports editor of the Sun Journal in Lewiston, Maine. He is the Northeast region chairman of the Associated Press Sports Editors. Right – tell that to all the home subscribers who get virtually no sports scores from the previous night, thanks to the Herald’s decision to ship its printing to Providence (a situation in which McIlwrath is presumably blameless). Regardless . . . there’s even more Herald newsroom news. 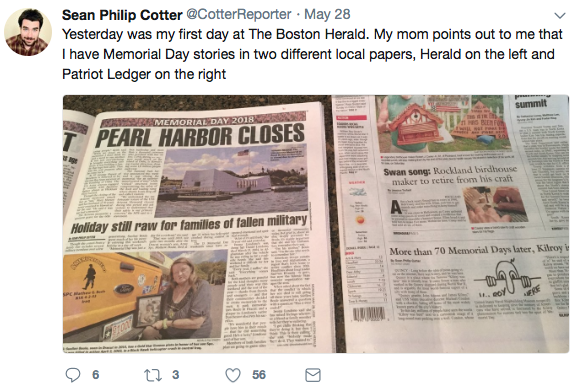 As the hardreading staff perused Twitter this morning, we came across this tweet from Sean Philip Cotter, late of the Patriot Ledger. Congrats and best of luck to all.